The Shakhsharli Tumblers are excellent racing homers. They are strikingly beautiful - indeed they have been named after their natural beauty. 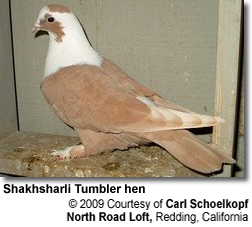 The Shakhsharli pigeons quickly grow confiding with their caretakers and are enjoyed for their unique personality traits as well as their pleasant appearance. In Iran, these pigeons are known as "Shirazi" - named after the Turkish town "Shiraz"
In Lebanon they are referred to as "Shaik"
They should have an extended or broad breast, a good wing span, flights carried above the tail, and a bold and proud stance. The Shakhsharli pigeons legs should be muffed, always slightly covering the toe nails. As the feathers reach the end over the toe nails, the color of the feathers turn white. The original colors of this breed are black, blue, yellow, and red. However, nowadays colors like ash red and yellow, bronze, black and dun, blue and silver, cream bar, red bar and sulfur have been bred -- and one very care blue shakhsharli with bronze bars has been described. A good specimen of this breed should have a white head and neck to the breast line forming a "V" shape. It also should be white to a line at the shoulder. This breed has three distinctive patches of color on its head. The patch on top of the head is referred to as "skull patch" and the two on the sides of the head are descriptively referred to as "cheek patches." The eyes are usually black or a dark brown - occasionally, some birds with pearl or red eyes can be found - the result of mixing breeds. These pigeons are strong fliers. They can fly up to two hours depending on the training they have received. Very few of them will tumble, but those that do tumble differently from say the Turkish tumblers.